Posted by Lisa at 4:32 p.m.
As for the photo I posted... we've been there many times. Spent several Sabbath afternoons throughout my lifetime there, just walking amongst all of God's beauty. Hubby makes a point of purchasing a State Park Pass every Spring. We like to travel to various State Parks on Sabbath's. By purchasing passes, we never have to worry about exchanging money on the Sabbath. February 28, 2007 at 11:54 p.m.
We went to a clay place yesterday. 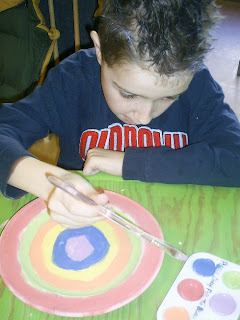 Ds decided he would like to paint a plate. Normally he chooses smaller things to paint, but he had saved his money for this one. They will glaze & fire it, and then we'll pick it up. March 1, 2007 at 12:25 a.m.
March 4, 2007 at 11:38 p.m. I think we are picking up his plate this week, so I'll post a picture of the finished product. March 5, 2007 at 11:46 p.m.